With all 8 of the Bloodthirsters cleaned and ready for assembly, I figured I would take a few minutes and make sure I had the right "red" for the force. I suppose you can paint a Bloodthirster any color you want as evidence by the Forge World picture above. Even a pale white, the guy looks mean. For this project though, my Client wants the classic "red" look to his models. It's the color that immeditely comes to mind when you think of Bloodthirsters and Khorne. Stick with the colors associated with an army and you get all the extra baggage too. In this case, it's all good stuff. Make them look like people think they should and they will fill in the rest to include all the associated fears that go along with them. Even though the models are ready for assembly, I mentioned before that this project neds to be done in very deliberate steps and there's no "guessing" what to do next. That being said, I sat down the other evening and painted a few "test" arms from my bits bin to make sure I had something I liked. I need the paint scheme to be simple and effective at the same time. I've got 8 of these monsters to paint and if my technique requires 30 plus coats of paint, I'm in big trouble. I need to be able to pull out all the detail on the models and not spend 12 years on one model. A combination of washes and transparent layering is how I'm going to do it. That and maybe a final line highlight in key places for effect. The arm on the far left is the one I'm going with. The others were "failed" experiments that I stopped once it had strayed too far from what I had in mind. It's actually similar to how I painted some Blood Angel Space Hulk Terminators a few months ago but I've changed the formula slightly to give me a richer red in the end. That's a very nice choice of colour scheme. Very rich red that would look amazing on the final pieces. Just out of interest, what kind of timescale you looking at for this project? Khorneguy: I don't know how long it's going to take. I just built the bases today (the rock outcroppings) and the next step is to assemble one of them (to include all the pinning and gs work) and paint it up completely as a test model. 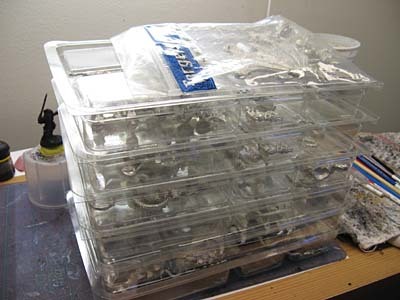 All the models have been cleaned of mold lines already. After that, it will be assemble all of the rest and then paint all of the rest in a batch process to keep all the models looking consistent. So,will you be painting them all the same way. Or will you have something distinctive to denote each being a seperate individual? Alan: They'll all be painted similar. I'll most likely change the color scheme for armour slightly but I'll also be posing them differently too. see, i actually like the middle one. It's got a good "was once living" feel, though it might be more appropriate for a possessed than a daemon... Any chance you could post up how you got that done? Blaise: He started with a light grey base coat and the was a series of washes. 2 Sepia, 1 Baal, 2 sepia, 1 Baal. It's just not "red" enough for me that I look at it and instantly think Khorne. All three look great, though it's amazing how far you deviated from what is generally considered 'red'. I'd say you've gone with the best solution by far out of those test samples. 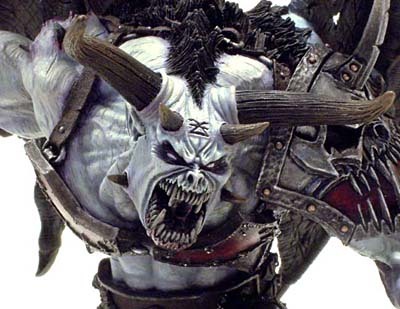 I once saw a pair of Bloodthirsters in the same collection, one was painted black to red and the other red to black and they were both amazing - but i prefered the red to black - similar to the balrog they sometimes show in White Dwarf. Maybe the right hand side (yellow) would work better if you started from black and had smaller highlights? - rich giving advice when your so much better and painting than I am I know! I am curious how you did get such a rich red like that? The first one is my favorite by far. jpalomba: I've got a tutorial coming up on it soon and I'll go into the exact colors I use. It's easy enought though, light grey prime, red basecoat, Baal Red wash, Devlan Mud wash and then highlight with a brighter red. I know its too late, but those Army Painter primers are amazing, especially the red. 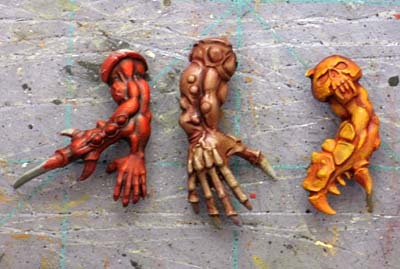 Charles: I'm working on a post right now about priming with alternative colors (other than black and white).